Equestrians know the dilemma of preparing for a large event and how many different tasks and small details precede a show weekend. One of those tasks is making sure that all of your horse’s paperwork is together and ready to go. Almost every horse person has had that moment of realization where the horse is on the trailer, tack is packed, the truck is started and realizing whether or not you have your important coggin paperwork. It’s the ultimate horse show nightmare. Ellen Eakin went on a mission to eradicate this issue. In a world with so much modern technology, why waste the time and mental energy about where your horse’s paperwork is? That is when the idea of EquestFile was born. A brand new revolutionary platform where horse and stable owners can keep an active database of every single piece of information about their horses in one digital place. “It was the last part of 2015 I had the idea to build EquestFile. It was during a moment where I was trying to look up when one of my horse’s was due for shots and I couldn’t find the files. I thought to myself in this day in age this should be mobile information that we should have with us at any time of day”, Eakin said. EquestFile.com is a mobile and desktop platform that allows you to keep important horse records with you at all time. 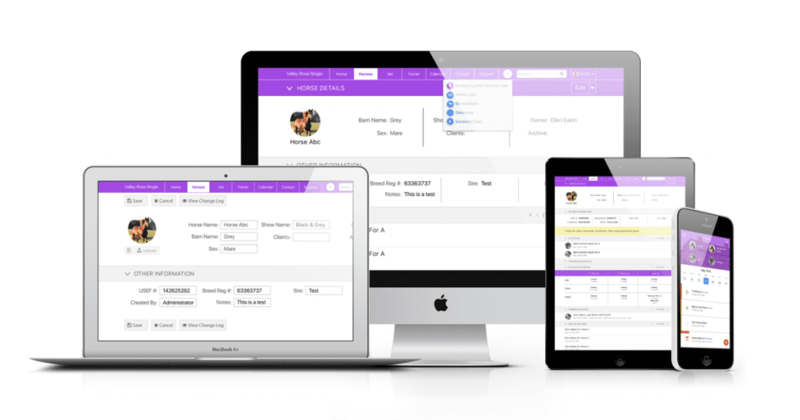 With quick and easy data entry (either on your phone or desktop), you never have to worry about making sure important people (like vets, trainers, and barn hands) know your horses feed schedule, injury history, and medical records. With a simple click of a button, you can send this information electronically, and also have peace of mind about keeping all of your files organized. “This program completely changed my life. If I drop a horse off with a trainer, I can send them a screenshot of the horse’s entire file in a simple text message. Gone are the days of wondering which leg was off on my horse from several years back. All of the data is stored simply and efficiently in one place,” Eakin said. Like any business, EquestFile had its challenges when getting started. “One of the hardest things for me has been that I am not a ridiculously technical person, nor am I a coder. Building this platform has been done with a wonderfully talented team. Some days I can’t do anything except encourage everyone that we were on the right path with this business. Luckily my MBA and previous career experiences really helped prepare me for the hills and valleys of owning a business. You just have to have the mentality to keep pushing through, one day at a time,” Eakin said. When gauging the target audience for the platform, Eakin went to her social connections for test subjects. She had placed a question on social media and waited to see if there would be a response. “I had put on social media that we were going to be launching this idea and we were looking for BETA testers. That’s really how we began testing the concept when it was in its early stages,” Eakin said. Eakin attributed that one of the hardest things for starting EquestFile was introducing the horse community to a brand new idea and technology. She thought that people would instantly want to trade their pens, paper and management notebooks for something more mobile. “It was a twist I never expected. I assumed people would want to have information immediately at their fingertips and that simply wasn’t the case. People are quite resistant to change at first” Eakin said. With perseverance and constantly introducing people to the platform, EquestFile began to grow. “We have a full support team ready to go on the other end of the platform. We want this to be something that completely changes people’s lives with their horses. If people need help using EquestFile, we are willing to help get their horses information into the platform so that it can be used in the best way for them. This program is so versatile. You can use all of the features or just one of them. Our biggest frustration is horse owners signing up for a trial and not asking questions about how to use the system properly, we want it to work smarter for you and make your life easier and more stress-free,” Eakin said. 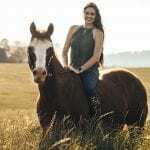 Eakin says that one of the best pieces of advice she can give aspiring equestrian entrepreneurs is to be persistent with their goals and to not give up. Eakin took a hiatus from horses for 33 years due to a career, family and a busy schedule. She said it is never too late to get back into the game. While being a businesswoman is one of Eakin’s passions, the other is her sport horses. Eakin currently owns and operates a barn on ten acres with 13 horses. She loves warmbloods and all of her horses have gone out into the ranks to be participants in jumpers, eventing, and dressage. “I use EquestFile personally. I love that my trainer and I can communicate all the time about what is happening with each and every horse I own. I never have to worry about what is going on with my animals. Whether it is an illness, or a great training session happened, I’m completely in the loop. EquestFile gives me the opportunity to communicate in real time. It’s been revolutionary,” Eakin said. EquestFile is available for a free 14-day trial. After that, packages start at $29.95 a month, for up to 10 horses. The other option available is $59.95 a month for an unlimited number of horses. Starting a business can be challenging, and at some times overwhelming. Eakin’s work ethic for EquestFile shows true horsemanship grit when it comes to impacting and changing the horse world, one hoof beat at a time. Ashley Culpepper graduated with a degree in Print Journalism and Two Minors in Ad / PR from Liberty University in 2013. Since then she has actively been using her media skills in a variety of realms including the horse world. 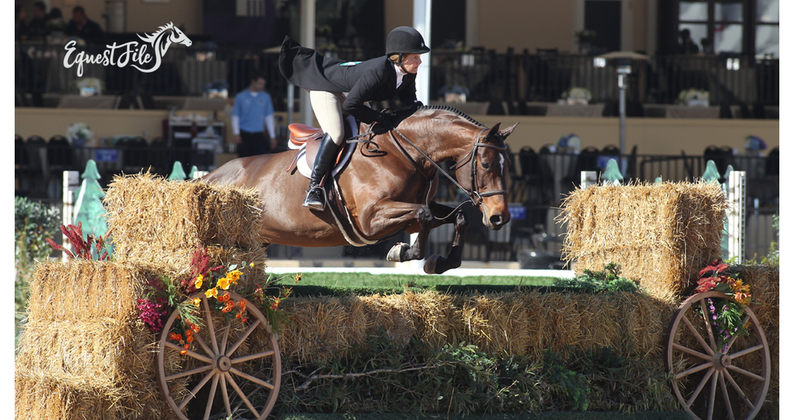 Ashley is a major equestrian enthusiast with over 18 years of riding and training under her belt. When she isn’t working, Ashley loves to be at the barn with her AQHA gelding Bandit who she fox hunts and shows.